Renewing Flies in my eyes Online Store! I finally Renewed my online Etsy store! There is still a lot of work to be done, but I managed to upload my first babies and toddlers’ listings and the shop is starting to reflect my currant interests. This is very exiting for me, and even though everything is made in baby steps I am very pleased with my progress and outcome. Please check it out and add my shop to your favorites to get updates and easy access. 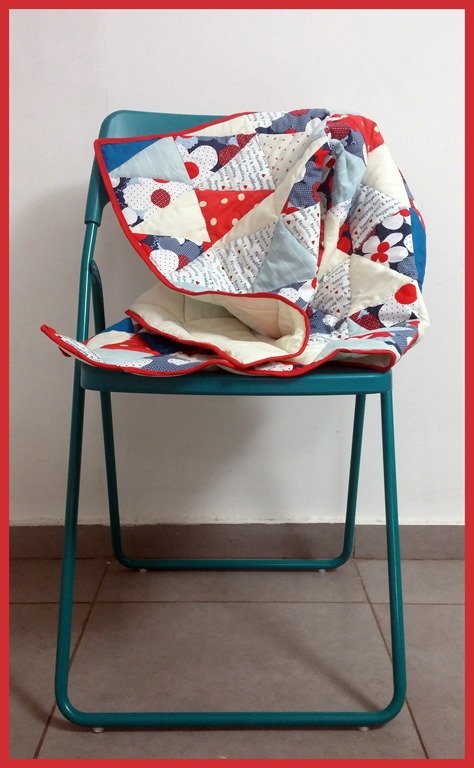 For some time now I’ve been harbouring a growing itch to start experimenting with quilting. It’s a form of design and sewing I’ve never tried, and recently got more and more exposed to it, starting with related Pinterest search results, this inspiring blog I stumbled upon, and just random items I started noticing, online and also in real-life. 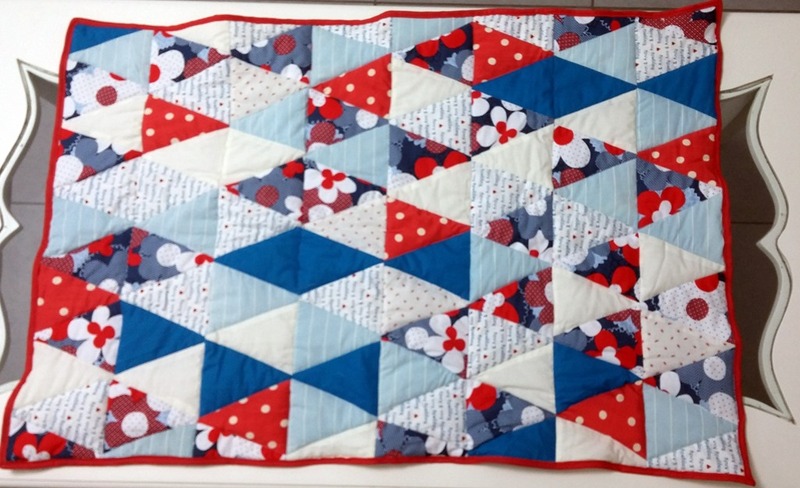 So, after it was nesting in me for a while, two months ago I got my chance to try and quilt something. I decided I’ll sew a quilted baby blanket for my newest family member soon to be born. Now that he is all born and healthy (Mazal-Tov cute new nephew! ), and I’ve given the present, I can finally share the process and the results here. 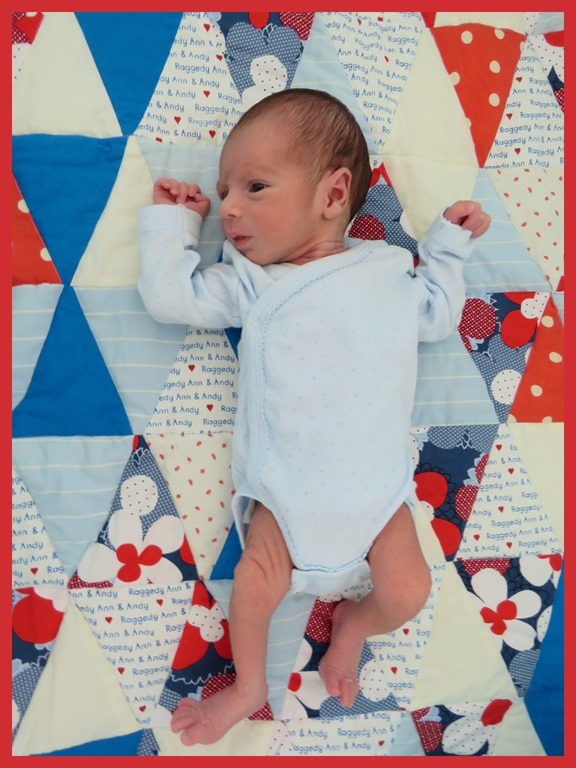 A baby’s blanket was just what I’ve been waiting for, since it is quite small in size and fits a first attempt at quilting. But, because it’s me, of course I had to upgrade at least a tiny bit, and not to settle for the big-square-blocks frame of a normal person. I decided to go with triangles. Lots and lots of small triangles. 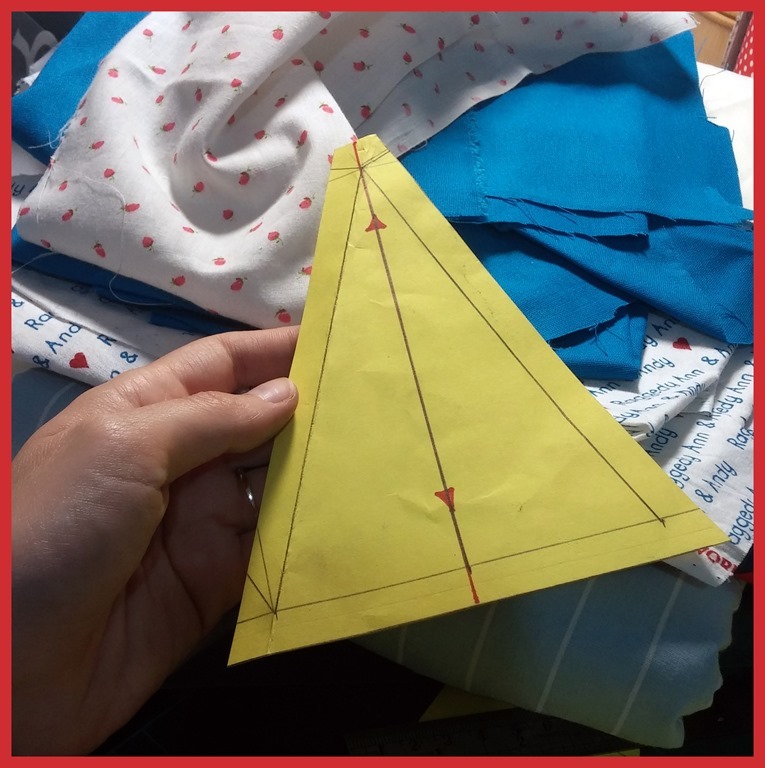 I scribbled a pattern (basically an Isosceles triangle), while waiting for Idan to come back from the store with a shiny new rotary cutter (my first!). Then I started brutally cutting through a pile of blue and red leftover fabrics I had. It was tiresome, but the rotary cutter was a very good investment that saved me lots of time. When all of the cutting was just about done, came the mind-boggling phase of mixing and matching the parts. This took me a while, and also sent me back to the cutting board to better balance the colours some more, after which came the relaxing sewing phase. Eight rows of thirteen triangles each later, I was almost done. 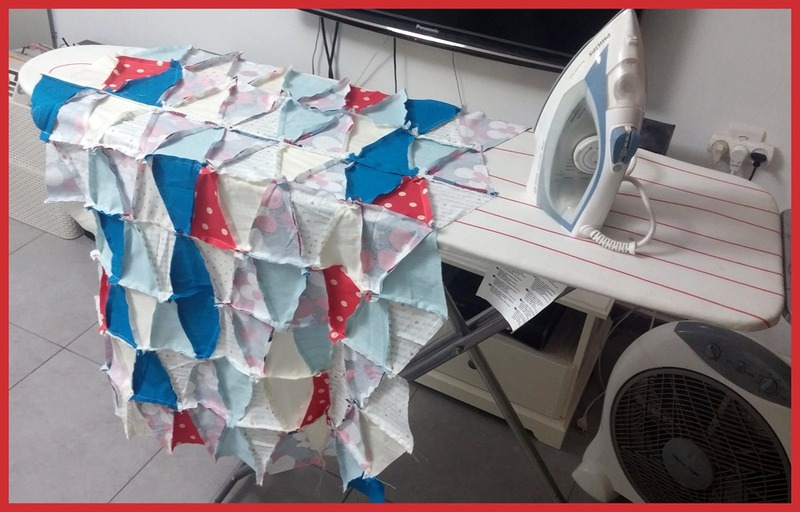 I cut a backing fabric, and an Acrilan middle layer, and started sewing them together to the front, not before ironing the whole patchwork to make it nice and flat. Then came the top stitching, which gave the blanket a real puffy and nice look. The whole process went surprisingly smooth. The mix-matching step was harder than I expected, and I wasn’t sure the combination looked remotely fine until it was sewed, and everything suddenly received shape. 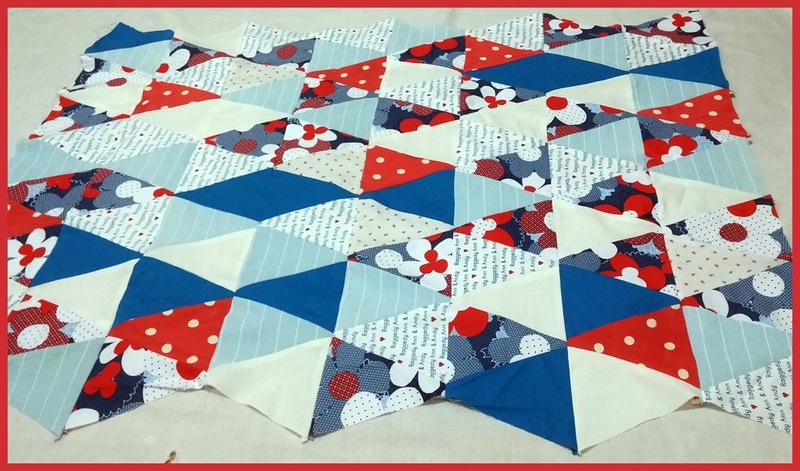 The one problem I did face was at the top quilting phase, as the sewing machine kept pulling the layers unequally and forced me to nip some parts. From the little I read online I got the impression that this is a common problem in quilting, and I guess purchasing a walking-foot would help, but it is very expensive and I’m not even sure it would do the job. A walking foot for my 215 Bernina would cost almost as much as a whole new (-yet cheaper and smaller, maybe even second hand-) sewing machine. All in all, this took about a week of evening work (and a small while later, another evening for sewing the binding). It measures about 70 by 100 cm, and contains 106 triangles. And the most important part: it left me wanting to quilt again.